Whether it's sales material, demo cases to show off or fan merchandise to look smart, you can find it all here! For cold winter days, as a guest slipper or a must-have for true Loxone lovers: The green Loxone felt slippers made from high-quality stone wool and authentic Merino felt to ensure that even your feet can adopt the latest Loxone style! 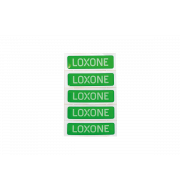 The Loxone Demo Case has been redesigned to be a comprehensive training aid for Loxone Partners and now includes both Loxone Air and Loxone Tree technologies. It’s the perfect tool for testing your configurations for projects. The Loxone Brochure is ideal for illustrating the possibilities of Loxone to potential customers and includes space for your own contact details on the back page. 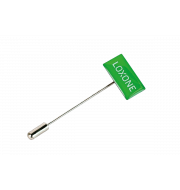 Sorgen Sie für mehr Aufmerksamkeit potenzieller Kunden auf Ihren Verkaufsraum, Messestand oder Veranstaltungen - mit dem Loxone Beachflag! Grab the attention of potential customers with this brightly coloured showroom sticker! Show the world your passion for Loxone - even outside your Real Smart Home - with our brand new car stickers!